For a three-week period in July 2018, an entire cast of performers gathered at Swarthmore College’s Department of Music & Dance in order to create a performance titled ARC. 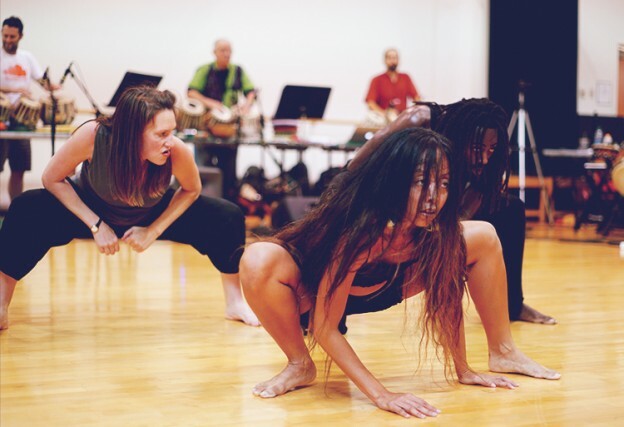 This performance project combines music and dance idiosyncratically to explore how different musical genres collaborate or clash and how dancer/choreographers interpret the uniquely created rhythms. This evening-length performance suite will bring together drumming traditions of tabla (from North India) and taiko (from Japan), along with contemporary Western, African Diasporic, and Southeast Asian dance. Taiko, or “fat drum” in Japanese, refers to designs and drums played in Japan and to the art of drumming in various formalized manners. Taiko has had a long history as an instrument, but as performance music, taiko is a post-WWII phenomenon. In North America, taiko was brought over by mostly working-class Japanese immigrants who used it as a form of community entertainment. “As taiko involves physical dynamism – that is, it’s an embodied form of drumming that can be considered choreography in and of itself – practitioners (especially anyone who feels underrepresented) find the art quite empowering and a means to express their identity particularly in a manner that the public will take notice,” Professor Small said. Tabla originates from the Indian subcontinent and consists of a pair of drums. Tabla is particularly important in Hindustani classical music since the 18th century. Playing the tabla involves extensive use of the fingers and palms in various configurations to create different sounds and rhythms. Because of the combination of different musical genres, each artist had to step out of their comfort zones to better understand each other’s work and methodology. Therefore, the effective collaboration needed to create ARC’smusic and dance during its creative residency highly depended on an environment of mutual openness. The cast consists of three tabla artists: Lenny Seidman, Jonathan Marmor, and Daniel Scholnick; three taiko artists: Joe Small, Kristy Oshiro, and Isaku Kageyama; and three choreographers/dancers: Laurel Jenkins, Annielille Gavino and Orlando Hunter. ARC was conceptualized by Lenny Seidman, a tabla player and teacher, a composer, Co-Director of Spoken Hand Percussion Orchestra, and Jazz Curator for Painted Bride Art Center. Seidman began studying tabla in 1971, but it was only when Seidman became a student of tabla maestro, Zakir Hussain, that he directed his performing focus exclusively to tabla. As for Professor Small, he is not only an Assistant Professor of Dance at Swarthmore College, but also a professional taiko drum artist. His creative approach often incorporates postmodern choreography and performance art. Professor Small has been a member of Marco Lienhard’s ensemble, Taikoza, since 2009. He is a disciple of pioneering taiko artist Eitetsu Hayashi and the sole foreign member of his Japan-based professional ensemble, Fu-Un no Kai, since 2012. ARC will be performed on Friday, October 5 at 8 pm in the LPAC Pearson-Hall Theater, and was financially made possible by support from The Pew Center for Arts & Heritage and Swarthmore’s William J. Cooper Grant.